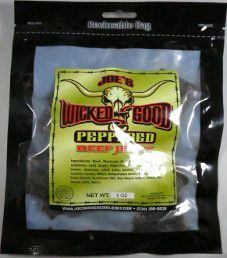 The next review on Joe’s Wicked Good Jerky will be on a 3 ounce/85 gram bag of their peppered beef jerky flavor. This jerky was graciously submitted for review by one of the co-owners, Traci Nixt. 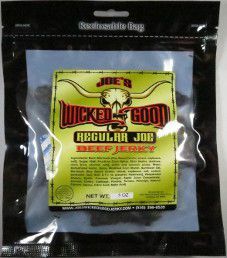 The next review on Joe’s Wicked Good Jerky will be on a 3 ounce/85 gram bag of their Regular Joe beef jerky flavor. This jerky was kindly submitted for review by one of the co-owners, Traci Nixt. 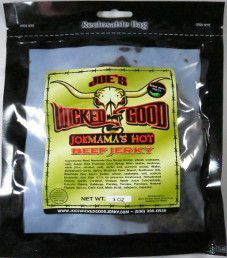 The next review on Joe’s Wicked Good Jerky will be on a 3 ounce/85 gram bag of their Joemama’s Hot beef jerky flavor. 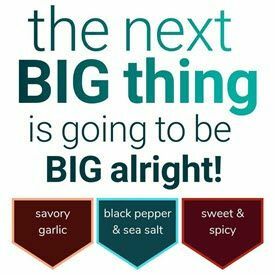 The flavor is described as using fresh jalapeno peppers. This jerky was graciously submitted for review by one of the co-owners, Traci Nixt. 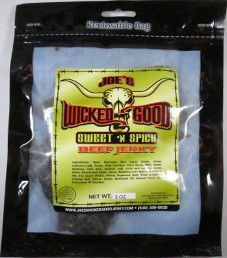 The first review on Joe’s Wicked Good Jerky will be on a 3 ounce/85 gram bag of their sweet ‘n spicy beef jerky flavor. This jerky was kindly submitted for review by one of the co-owners, Traci Nixt.